Home / Awareness / News / Viral / PARENTS, BEWARE! Don't Leave Your Toddler Alone With Their Younger Siblings! Must Watch! PARENTS, BEWARE! Don't Leave Your Toddler Alone With Their Younger Siblings! Must Watch! In the America, people install lots of CCTVs into their homes in an attempt to guard and monitor their children even when they’re out of the house. This enables them to see what their kids are up to, especially in their maid-less culture where the children are often left by themselves or are entrusted to babysitters. In a video that was released by Facebook fan page ‘Danified,’ something terrible happened to one of the infants that were caused by his or her older sibling—not by a babysitter or a maid. The clip is forty-eight seconds long and has already received 7.9 thousand views as of this writing. It began with a young girl approaching her two younger siblings, who are both infants. 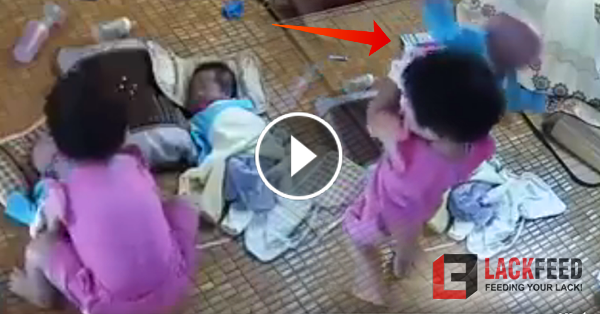 She removes one of the infant’s blankets and carries it over her shoulder in a careless way. Then the next scene surprises us-—she suddenly falls backward, leaving her infant sibling on the floor! The infant cries and the other one, who is untouched by the young girl, cry as well. The young girl remains in a sitting position. She tries to carry the infant who fell, but the latter only continues to cry. Moments later, their mother appears and the young girl immediately drops her sibling. The mother rushes to them and screams in disbelief, hitting the young girl briefly, before finally carrying the fallen infant in her arms. Arnel Antonio Manguera: “Kinarga lang kapatid.. Pabaya ina.. Nagulat yung anak kaya binitawan ulit sa sigaw ng INA MO..” with two angry-faced emojis. See the whole shocking incident below! What do you think? If you were in the mother’s shoes, what would you do to your older child?